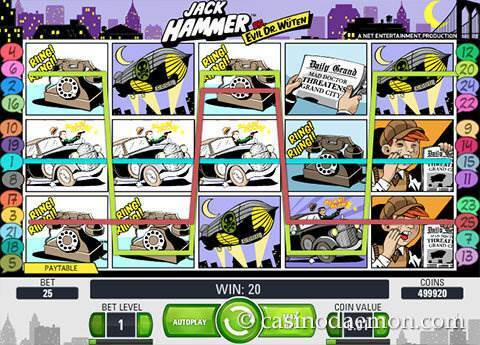 Jack Hammer is an action packed slot, and it tells the story of private detective Jack Hammer and his quest to find and stop Evil Dr. Wüten and his mad experiments. The game is drawn in a comic book style, and every symbol is represented on its own reel. The slot has a few interesting special features, one of them is sticky winning combinations, which will hold symbols of a winning combination in place and spin the other reels again for a chance of getting a higher combination. It is also possible to trigger free spins with tripled winnings. As we expect from Net Entertainment, the quality of the game is very good, and the slot game is a lot of fun to play. There will be a few rounds during which you won't win anything, but this will be made up for when you start the sticky feature or the free spins. It is possible to win up to 250,000 coins in just a single game round. The theoretical return to player is 97%. 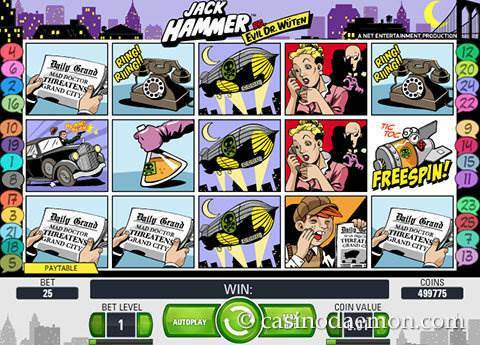 If you fancy a spin at Jack Hammer on the go, you can also find the game in the Netent Touch selection of mobile slots and play it on an Android or iOS device. 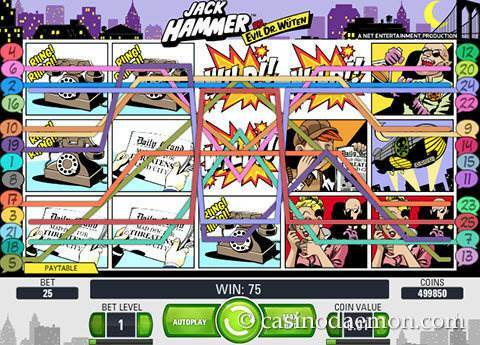 Join the adventure and play Jack Hammer for free here. If you like the game and the fantastic story you can also find the slot at one of the casinos listed on this page. The game has a wild symbol to replace other symbols for winning combinations, but it does not replace the free spins symbol. The free spins are triggered when you get at least 5 free spin symbols anywhere on the reels. Then you will be awarded 10 free games. The maximum amount is 30 free spins which will be started when you have nine or more free spins symbols. During the free spins all winnings will be multiplied by 3 as well. Each time you have a winning combination the symbols of that combination are held in place and all other reels will spin again. This means that you will have another chance of improving the combination. This will continue until you have no further combination symbols on the reels, and then you will be paid out the winning amount. This also happens when you get at least 3 free spins symbols, which means that you are getting a second chance of triggering the free spins. Jack Hammer from the developer Netent has 15 reels that are laid out on a grid of 5x3. 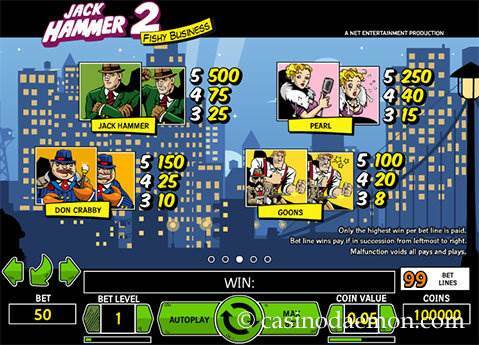 The game has 25 fixed pay-lines and the coin values can range from between 0.01 and 1 £/$/€. It is also possible to select between 1 and 10 bet levels. This means that the minimum you have to play every round is 0.25 £/$/€, and the maximum is 250 £/$/€. The highest pay-line win is 1000 coins, which is multiplied according to your selected bet level.